« Is Clarence Thomas the Best Supreme Court Justice? Many people assume that Europe is the land of high-tax welfare states and America is an outpost of laissez-faire capitalism. We should be so lucky. The burden of government in America is still lower than it is in the average European nation, but the United States is a lot closer to France than it is to Hong Kong – and the trend is not comforting. We recently endured the embarrassing spectacle of President Obama arguing with Europeans that they should increase the burden of government spending. Now we have a new report from the European Commission indicating that the average corporate tax rate in member nations of the European Union has plummeted to just 23.5 percent while the corporate tax rate in the U.S. has stagnated at 35 percent. 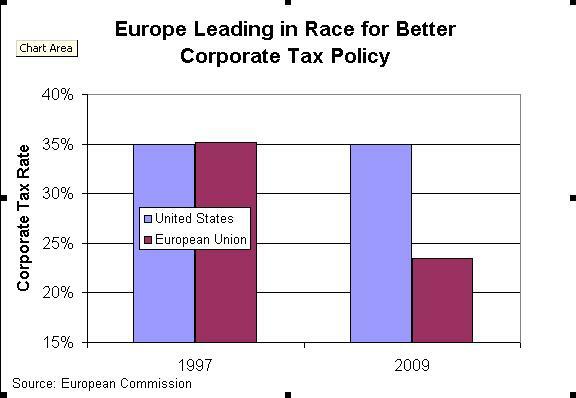 In the past dozen years alone, as the chart illustrates, the average corporate tax rate in the European Union has dropped by nearly 12 percentage points. To make matters worse, the corporate tax rate in America actually is closer to 40 percent if state tax burdens are added to the mix. This is not to say that European politicians are reading Hayek and Friedman (or watching Dan Mitchell videos on corporate taxation). Almost all of the positive reforms are because of tax competition. Thanks to globalization, it is increasingly easy for labor and (especially) capital to cross national borders to escape bad policy. As such, nations now have to compete for jobs and investment, and this liberalizing process is particularly powerful among nations that are neighbors. Not surprisingly, European politicians despise tax competition and instead would prefer to impose a one-size-fits-all policy of tax harmonization. These efforts to create a tax cartel have a long history, beginning even before Reagan and Thatcher lowered tax rates and triggered the modern era of tax competition. The European Commission originally wanted to require a minimum corporate tax rate of 45 percent. And as recently as 1992, there was an effort to require a minimum corporate tax rate of 30 percent. Fortunately, the politicians did not succeed in any of these efforts. As such, tax competition remains alive and corporate tax rates continue to fall. What remains to be seen, however, is whether America will join the race to lower corporate tax rates – and more jobs and investment. on July 5, 2011 at 9:41 am Do Lower Corporate Tax Rates Means More Revenue?